Birth year wines are very special. A friend of mine, who lives in Bath, was born the same year as me: 1953. 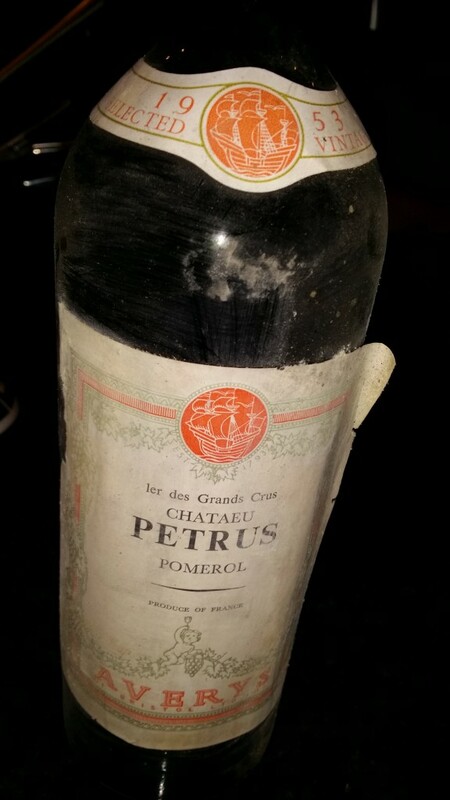 He and his wife have been inviting me for the longest time to come and share a bottle of 1953 Pétrus they have been saving. Well, that moment finally arrived on a trip to England this summer. As an aside, Bath is one of the most beautiful cities in the UK and, indeed, in Europe. My friends prepared a delicious meal and served 3 wines to accompany them. 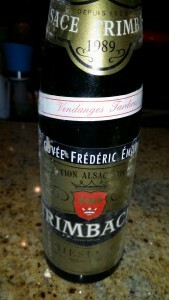 The first was a 1989 Trimbach “Cuvée Emile” vendanges tardives, which was served blind. I thought it was a Pinot Gris from Alsace. The wine was golden yellow, but looked younger than its 26 years (had I tried to guess the vintage). The nose was ripe and complex, but the wine was medium-sweet rather than sweet on the palate. It had evidently “eaten some of its sugar” as the French say. The varietal characteristics didn’t come through screamingly, but this was a very enjoyable aperitif. The main course consisted of expertly cooked lamb shanks. 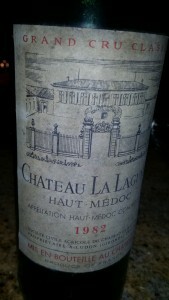 The first red wine was 1982 Château La Lagune. The last time I had this wine was at Restaurant Laurent in Paris, perhaps 7 or 8 years ago. Unsurprisingly, the bottle consumed in July 2015 was more evolved and gave the impression of being much more fluid and easy-to-drink. It had a classical nose with hints of pencil shavings I associate with Pauillac, but not the same body. This wine epitomizes the difference between subtle wines you love to drink with fine food as opposed to point-winning monstrosities. The star of the meal was obviously the 1953 Pétrus. This English-bottled wine (Avery’s of Bristol, a well-reputed firm) was still very much alive, although past its best. If served blind, I’m sure most people would have thought it a decade or two younger. The nose was sweet and enigmatic, with lovely nuances: empyreumatic, aniseed, vanilla, almond, etc. The taste was remarkably delicate and silky, a wine to meditate on with a very soft, long aftertaste. My host opened the Pétrus, decanted it, and served it immediately. In retrospect, it would have been better to let the wine breathe longer because it was not particularly fragile and the aromatics blossomed over time. This was a tremendous experience that I am very lucky to have enjoyed. Anecdote: please note the misspelling of the word “château” on the label! Posted in Uncategorized and tagged Alsace, Bordeaux, La Lagune, Pétrus, Pomerol on July 22, 2015 by AlexR.